From the moment you walk in the door our highly motivated and trained front desk staff are ready and willing to assist! We have three levels of coaches: Head Coaches, Assistance Coaches and Junior Coaches. All of our coaches are CPR certified. Karrie graduated from Lindenwood University with a Bachelor's degree in Education. 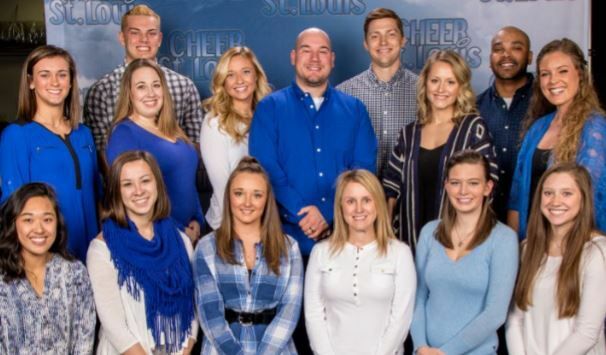 She taught elementary school for three years before dedicating her career to cheerleading. Karrie cheered in middle school, high school and college. Collectively, she has over 20 years experience in the cheer industry. She has staffed for NCA and has been a program director and head coach for 14 years. She has led numerous teams to National Championships. Karrie is also certified in PCA as well as CPR. She is USASF certified for levels 1-5 in Building and Tumbling, and is a USASF staff member. In 2014 she achieved her dream of opening her own gym. Tara graduated from the University of Missouri - St. Louis with a Bachelor’s in Business. She has dedicated her career to accounting and prides herself in delivering quality customer service. Since graduating in 2006, she has focused on helping a large corporation build its brand new banquet business from the ground up by writing and implementing policies and procedures that soon gave them the opportunity to run smoothly and grow rapidly. Today she is assisting Karrie with normal day to day business operations. Josh graduated from Lindenwood University in 2012 with a Bachelor's Degree in Business Administration. He cheered all 4 years of his college career and was an NCA National Champion in 2011. Josh is now an assistant Cheer Coach at Lindenwood University. Josh has coached cheerleading and tumbling for over 8 years, and is USASF certified in levels 1-5 in Building and Tumbling. He has led numerous teams to National Championships, and has coached teams at The Summit Championships as well as USASF Worlds Championships. Ricky graduated from Maryville University in 2015 with a Bachelors Degree in Sports Business Management. He spent three years as a Lindenwood Cheerleader and has 11 years experience coaching cheerleading in the All-Star industry. He is USASF certified in levels 1-5 Tumbling and Building. He has led several teams to National Championships, and has coached teams at the Summit Championships as well as USASF Worlds Championships. Jordan began his cheerleading career during his senior year of high school, and earned a scholarship to Lindenwood University. Here he was on the competition squad for two seasons. He graduated from Lindenwood in 2010 with a degree in Biology. Jordan has 11 years coaching experience as well as being a member of the cheerleading industry. Jordan has spent the past four years as an active member and employee of the United States All Star Federation (USASF) as an instructor, and an active employee at the past to USASF Worlds events. 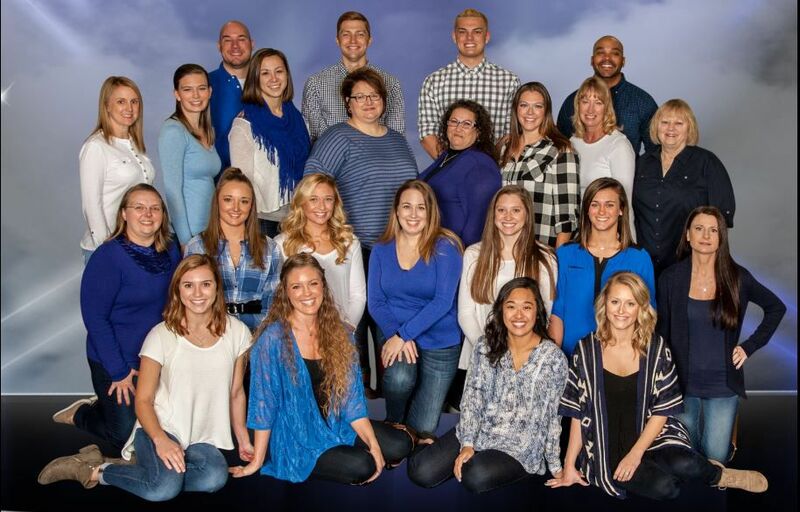 Jordan worked for NCA as an instructor who traveled the midwest, teaching summer camps. He is an active judge on the weekends as a way to make sure he is always on top of industry trends. Jordan is in his third season with Cheer St. Louis Jordan is certified in levels 1-5. Brandie has been in the cheer industry for 9 years. She was competitive cheerleader for 6 years, and is now in her 4th year coaching for Cheer St. Louis. Brandie graduated from Fort Zumwalt East High school and is currently attending St. Charles Community College. Brandie is credentialed in Level 1 for Building and Tumbling. 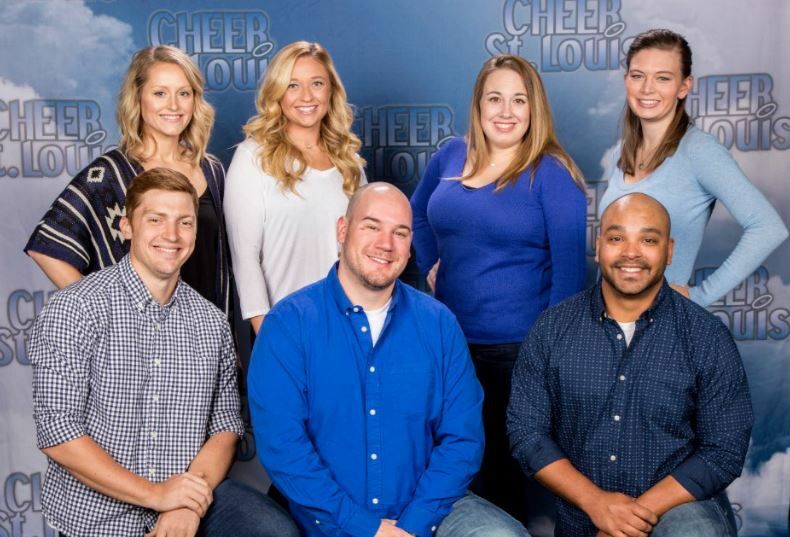 CJ has been coaching at Cheer St. Louis since they opened in 2014. CJ cheered competitively at Cheer St. Louis for 2 seasons and cheered competitively 3 seasons prior to that. She is currently a head coach and tumbling coach. She is USASF certified through level 3 tumbling and building. She is also a certified PCA Coach as well as certified in CPR and First Aid. Heather attended St. Louis University where she graduated with a Bachelor's Degree in Exercise Science in 2013, and a Masters Degree in Athletic Training in 2014. She has coached cheerleading for over 10 years at the high school, recreational and competitive levels. Heather is also a Certified Athletic Trainer for a Sports Medicine physician in the West County area. She covers events at the high school and youth levels, providing services such as prevention, assessment, treatment and rehabilitation of injuries. Heather is USASF certified levels 1-3 in Tumbling and Building. Bre is a 7th/8th grade drama teacher who has also been coaching cheerleading for 17 years. She was a high school competitive coach in Illinois before moving to the All Star Cheerleading industry. She is also a cheer choreographer at the high school level. Bre is USASF certified levels 1-3 in tumbling and building. Bre is CPR certified and has PCA coaching certification. Sara has been coaching a total of 7 years. She attended Lindenwood University where she cheered on their competitive squads. Prior to that, Sara also cheered on school teams for a total of 9 years. Sara is married and has 2 children. Sara is USASF credentialed Levels 1-4 for tumbling and levels 1-3 in building. 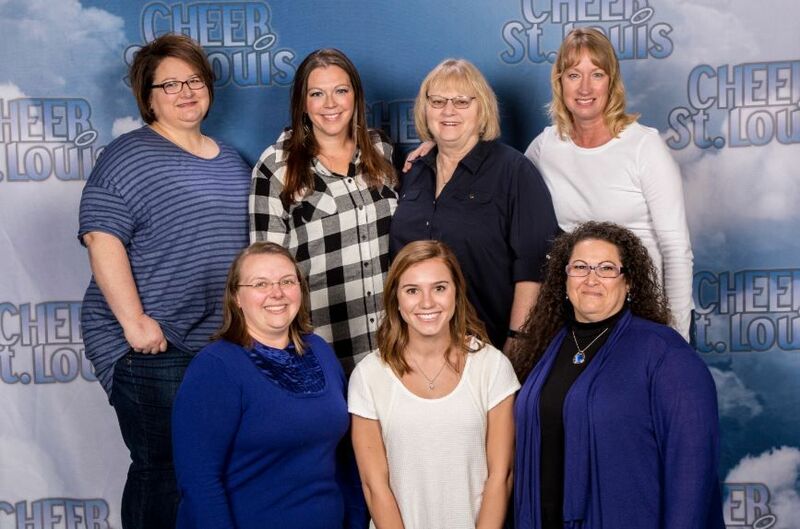 Maranda has coached a total of 2 years, however this is her first year coaching at Cheer St. Louis. Maranda graduated in 2015 from Lindenwood University with a Bachelors Degree in Elementary Education. She is currently a 2nd grade teacher for the Fort Zumwalt School District. Maranda has cheered competitively for 12 years for various local gyms, as well as cheering at Lindenwood University. Maranda is USASF credentialed. Joe has been in competitive cheerleading for 9 years and has competed at many major nationals ranging from the East to the West coast. He has also attended the Cheerleading Worlds seven times and the Cheerleading Summit once. This is his first year of coaching at Cheer St. Louis. Joe graduated from Freeburg high school in Freeburg, IL. He is credentialed in tumbling and stunting levels 1-3. Nick graduated from Fort Zumwalt West High School in 2017. He has been a cheerleader for five years, and has been a coach in the All Star industry for three years. Nick is attending Lindenwood University, where he will study to become a Nurse Practictioner as well as seek an advanced degree in Social Behavior. Nick plans to continue his athletic career by cheering for Lindenwood University. Lexi has been cheering competitively for five years, the last 3 years being with Cheer St. Louis. Lexi has been coaching for two years. Lexi attends St. Charles Community College.